Export shipping crate services, overseas packing crate services, custom pallets, ISPM 15 crates, Central Maine Crate is Maine's largest supplier of custom wooden shipping crates, servicing Maine and New England. At Central Maine Crate our service is what has kept us in business for twenty five years. Sure, we produce a great product, but we feel our service (from start to finish) is what keeps our clients coming back. We once had a new client call for a large crate. It needed to be constructed, packed and on a plane in three hours. The client is a half hour away and the airport is another hour and fifteen minutes. Well it was close but the job got done. That new client has now been with us for sixteen years. At Central Maine Crate, we consider ourselves part of the TEAM! We would like to become part of your team. Central Maine Crate stamps and certifies all export shipping crates and skids to insure that your products get to your international customers without costly customs delays. Central Maine Crate will deliver to your company or to any destination that is required. 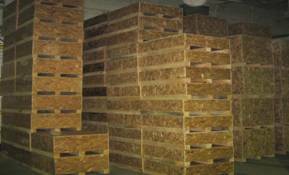 We can inventory your crates, pallets or skids and deliver them as needed. No need to use your valuable space for storage.